The Association of Administrative Law Judges (AALJ) is the professional association that 80% or more of Social Security ALJs belong to, and carries as part of its mission statement a commitment to the “independent and honorable administrative judiciary as indispensable to justice in our society.” In the President’s Newsletter dated November 16, 2018, the AALJ responded to a new regulation proposed by SSA to give sole discretion in how hearings are scheduled (in person or by video) to the Agency, thereby taking away the claimant’s ability to opt for an in-person hearing with the ALJ who is going to decide their case. AALJ President Marilyn Zahm commented that ” [t]he Agency’s explanation for these drastic changes is spurious – the Agency already easily moves caseloads from backlogged hearing offices to other locations around the country. There is no need to force claimants to give up their right to an in-person hearing – the Agency’s own statistics show that only 32% optout of a video hearing. Thus, two-thirds of the caseload can be moved without the need for this regulation. Where is the need to be able to move ALL hearings and deprive all claimants of the right to in-person hearings?”. OBL agrees wholeheartedly with ALJ Zahm’s assessment, and applauds her strong words and analysis. We also wonder why it often seems like the AALJ and Social Security representatives’ professional associations are often in a contentious relationship. Plainly, the AALJ’s commitment to the integrity and independence of ALJs is something that all claimants representatives do (or should) support. The AALJ website can be found at https://www.aalj.org/. 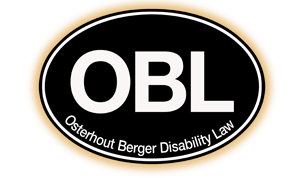 → Following an appeal by Osterhout Berger Disability Law The Hartford overturns its denial of Own Occupation benefits to a highly-skilled Project Director.